Macada interactive overlay is an infrared touchscreen frame. 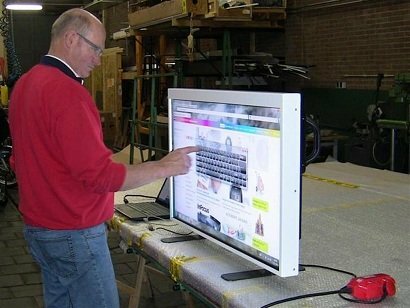 With this, any ordinary LCD or plasma screen that is connected to a computer, can be converted to an interactive projection screen. At any moment. As a result, this product is ideally suited to situations in which the interactive function is only required now and then. 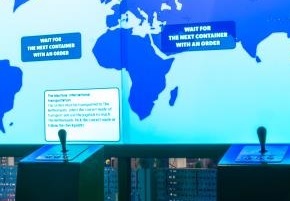 The Macada interactive overlay also offers the perfect solution when an ordinary monitor has already been installed and an interactive projection system is needed subsequently. An interactive projection screen is often used in classrooms, meeting rooms and company premises. During assembly, the overlay is placed on top of the LCD or plasma screen. In the corners are two CCD (Charge Coupled Device) detectors. Together with an infrared transmitter, these cameras register the movements of a finger or a pen over the surface of the screen. In this way, the screen becomes an interactive projection screen, your finger or pen acting as a ‘mouse’. The screen has a very high tactile sensitivity; it registers the slightest touch of finger or pen. Macada Interactive Overlay is produced in dual-touch or multi-touch versions: multiple fingers/pens can be used with certain applications. Normal version: choice of 2 (dual) or 6 (multi) touch points. Versions with more touch points (10 – 16 – 32) on request. Compatible with Windows 7 and higher, Linux en Android. Connection: USB 2.0 (Full Speed).